Understanding and maintaining an edge over the competition in terms of creativity, quality, and efficiency while meeting business and market demands can be tough. We at Outsource2india bring in decades of product design experience to help you. Whether you have a straightforward design concept, a minuscule idea, or an elaborate plan for a product, Outsource2india helps you materialize those ideas into designs that are ready to hit the production floor at a 60% lesser cost. Our experience in product design services covers a wide range of products from across industries, be it heavy machinery, medical equipment, home improvement products, electrical goods, toys, personal appliances or outdoor products. At Outsource2india, our product design engineers have the required knowledge and technical skillset to delight your target audience with a design that works by adding value and style to your brand. We follow ISO certified quality process to ensure our product design services meet intellectual and physical requirements while ensuring maximum functionality of your designs. At Outsource2india, we are inspired by people and companies who come to us with a vision for a product and we enable them with our technical expertise to materialize that vision. Bridging the gap between an idea and technology, we work on designs that are feasible, human-centered and economically efficient. 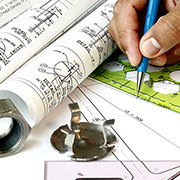 Our global approach to product design services helps us meet client needs while complementing client capabilities with our engineering skills. Why Choose Outsource2india for Product Design Services? Outsource2india follows a strong consulting practice aided by deep domain knowledge and talented professionals which enables us to provide the total cost of ownership (TCO) without compromising on quality. Testing / Validation Experience - Our team at Outsource2india provides both virtual (simulation) as well as experimental testing experience and comes with testing proficiency on all major testing tools. We use tools like FEA / CFD and experimental methods like optical methods, vibration / acoustics, etc. Outsource2india provided accurate product design support to an Australian oil and gas giant. Our team of highly experienced mechanical engineers provided the services within the required deadlines. Outsource2india works with you to put together configuration from standard parts or do a detailed design or work on an old concept to newer design capabilities or provide a design from scratch, depending on your requirement. Our Mechanical Product 3D Rendering and 2D/3D drafting and designing expertise enables us to provide you visibly superior designs. By partnering with Outsource2india, you get instant access to a global talent pool. We can help you cut down your engineering service expenses by 50% and help you avail a much-reduced time to market. If you have decided on outsourcing product design services to a third-party, look no further. Contact us to discuss your product design related requirements with us and learn how we can help you out.